For centuries, the Tower of London has been home to a group of famous avian residents: the ravens. Each year they are seen by millions of visitors, and they have become as integral a part of the Tower as its ancient stones. But their role is even more important than that—legend has it that if the ravens should ever leave, the Tower will crumble into dust and great harm wil For centuries, the Tower of London has been home to a group of famous avian residents: the ravens. Each year they are seen by millions of visitors, and they have become as integral a part of the Tower as its ancient stones. But their role is even more important than that—legend has it that if the ravens should ever leave, the Tower will crumble into dust and great harm will befall the kingdom. The responsibility for ensuring that such a disaster never comes to pass falls to one man: the Ravenmaster. The current holder of the position is Yeoman Warder Christopher Skaife, and in this fascinating, entertaining and touching book he memorably describes the ravens’ formidable intelligence, their idiosyncrasies and their occasionally wicked sense of humour. The Ravenmaster is a compelling, inspiring and irreverent story that will delight and surprise anyone with an interest in British history or animal behaviour. I found every aspect of this book incredibly well done. From the personal tone it is written in, to all the interesting information it imparts. We get to know the Ravenmaster, his time in the military, and what it takes to get this position in the tower. We learn about the Ravens, not only the stories that surround their being at the tower, but an up close look at their habitats, and even their personalities. One of their favorite snacks are dog bones soaked in blood. Well, they are carnivores, I found every aspect of this book incredibly well done. From the personal tone it is written in, to all the interesting information it imparts. We get to know the Ravenmaster, his time in the military, and what it takes to get this position in the tower. We learn about the Ravens, not only the stories that surround their being at the tower, but an up close look at their habitats, and even their personalities. One of their favorite snacks are dog bones soaked in blood. Well, they are carnivores, after all. All the superstitions associated with Ravens, from the heralders of death, to one of my favorite parts, the connection between the esteemed Charles Dickens and his use of Ravens in his novels. The most famous being the Raven Grip in Barnsby Rudge. As the author notes, "I may have a rather partial view, but to my mind Dickens counts as a genius not because of his prolific output, nor because of his famous public performances and his great public works, but because he gets every single detail about Ravens right!" Of course the famous inhabitants of the Tower, and stories associated with them and the tower itself are included. In fact, for a book without a large number of pages, there is much information s d entertainment to be found. I enjoyed every moment of my reading experience, but then again this is the season for the macabre. I vividly remember the day of Brexit. Nobody knew what the hell was going on and the pound fell off a cliff and we saw the leading Brexiteers looking nauseous and terrified as they realised their actions had catastrophic consequences, and the Prime Minister's resignation only made it to #3 on the news agenda. It was chaotic and terrifying in the days when that wasn't standard practice. I was on Twitter of course, and there I saw a tweet from the Ravenmaster with a picture of the Tower ravens tha I vividly remember the day of Brexit. Nobody knew what the hell was going on and the pound fell off a cliff and we saw the leading Brexiteers looking nauseous and terrified as they realised their actions had catastrophic consequences, and the Prime Minister's resignation only made it to #3 on the news agenda. It was chaotic and terrifying in the days when that wasn't standard practice. I was on Twitter of course, and there I saw a tweet from the Ravenmaster with a picture of the Tower ravens that read, simply, "We are still here." I welled up. It meant a lot. This is a marvellous book about a bizarre job. Mr Skaife is a Yeoman Warder and in charge of the Tower ravens because if they ever leave the Tower, the country will fall. He actually shows that to be a relatively recent myth, but that doesn't make it any less true IMO: it's deeply embedded in the national consciousness and every story has to start somewhere. This is very much a book of stories, one of those reads that feels like you're in the pub with a really interesting bloke. Chatty, discursive, a lot about the life that brought him to this point, and loads about the ravens he adores. You learn about raven flight feathers and bird distribution globally and raven myths and Army drumming and what it was like to be on Army duty in South Armagh or Belize and how the Warders cope with the visiting public (taking the mickey, basically), and it's all just a really interesting slice of human life. I'm now desperate to go to the Tower again, tourist trap that it is, just to check out the birds. A lovely book. I've been a fan of ravens for a long time and always detested their bad reputation thanks to silly old superstitions that seem to mostly derive from their physical appearance and the fact that they are omnivores. Especially the latter seems only yet another sign of their extreme intelligence because all of us who've paid attention in biology know that highly specialized (picky) animals are much more likely to die out (yes, I'm also talking about you, sabre-toothed tigers). It all began with Sir D I've been a fan of ravens for a long time and always detested their bad reputation thanks to silly old superstitions that seem to mostly derive from their physical appearance and the fact that they are omnivores. Especially the latter seems only yet another sign of their extreme intelligence because all of us who've paid attention in biology know that highly specialized (picky) animals are much more likely to die out (yes, I'm also talking about you, sabre-toothed tigers). It all began with Sir David Attenborough, as is often the case. Yes, I adore the man and always will. He is the prime example of a human not caring about looks but ability and he was the one telling me (through one of his BBC programmes) about the intelligence tests (Kerplunk games) for ravens that most of them seem to ace every time. Then, some time ago, I somehow heard about the Ravenmaster on Twitter. I didn't know anything about the man or his job but the tweet had the picture of a gorgeous raven so I clicked and scrolled - and became addicted to the man's updates. Through his photographs and little videos I got to share his enthusiasm and see some of the quirky birds almost every day. My plan had been to see London eventually, the plans having been thwarted by a lack of money for a long time, and those plans only got invigorated by the prospect of meeting these special corvids personally when visiting the historic site! And this year my dream finally came true. I had the money and didn't care that I'd had to go on vacation on my own, I could do this! Thus, I booked tickets and made plans and got really excited. Imagine my delight, therefore, when I heard that the man was going to publish a book about his life at the Tower and the ravens there! So when I was in London this past week, I had to get a copy before making my way to the Tower and I did. It wasn't the edition I had originally wanted but I didn't care (unusual for me). Packed and ready to go, I got there early and went on one of the apparently famous Yeoman Warder tours (like an idiot I hadn't known much about the Tower in advance except for some juicy historical bits). Following the sarcastic "elderly and rude" (his words) Yeoman Warder and listening to his take on the history of the fortress was delightful. Afterwards, I met a raven posing for tourists when exiting the exhibition of the crown jewels. I took some pictures, moved on. After walking through yet another exhibition (the Fusiliers Museum), I made my way to the raven enclose, heart set on meeting the Ravenmaster and getting my book signed. And he was there! I only noticed by a complete coincidence despite his uniform. I chatted him up and ... However, like a complete idiot, despite him being so nice and friendly and us chatting for a few solid minutes about everything from the ravens themselves to our shared admiration for Sir David Attenborough, I forgot to ask for a feather - because it is mentioned in the book that the Ravenmaster sometimes has some that he hands out. *doh* He had to leave, however, because despite it being his day off, he had to watch some students who were researching and filming the ravens' behavioral patterns and talking to some journalists (I was lucky he was there at all)! Thus, I made my way to yet more interesting sights around the Tower (there is no shortage of those), tried kicking myself for not having remembered to ask about the feather, kept watching the birds and even entered the gift shop where I got a cute raven pin and pencil with a raven on top. I was contemplating my chances of finding him again when I noticed him while walking the battlements and made a split-second decision to stalk the poor man. So I descended the stairs, keeping an eye on the Ravenmaster and the reporters filming him, waited in front of the enclosure where Poppy (youngest member of the raven staff) promptly entertained me when a student entered her enclosure and tried to take one of her toys away (yes, pure Schadenfreude, but the woman deserved it - she wanted to take a toy away! ), which prompted the cheeky bird to show her who the boss was and chasing her out. Yes, I chuckled, I may have even laughed loudly (no, I'm not sorry) because even the bird looked at me. BWAHAHAHAHAHA! The Ravenmaster then walked down and out of the enclosure with the journalists, I followed (yes, I know, but I wanted a feather! ), waited until the journalists had said goodbye for what must have been the fourth time - and then I made my move! If you ever read this, Ravenmaster, I really am sorry. *lol* Anyway, I found the courage to chat him up again, inquired about the feather an lo and behold, I didn't get one but TWO!!! But that isn't the end of this glorious tale, nope. I was so incredibly happy after leaving the food preparation rooms where he kept dead chicks and the afore-mentioned feathers that I had to sit down. I opted for one of the benches around White Tower, hoping for a good shot of one of the ravens. And suddenly there was Poppy! She was walking from left to right and left again behind my bench, probably trying to scare me so I'd drop some food. Alas, I had deliberately nothing on me. Instead, I turned around, facing her and started talking to her. Yes, I talk to animals, I don't care what you think about that. But here is the amazing thing: she cocked her head, hopped onto the litter bin and from there onto my bench next to me AND STARTING CHATTING BACK (no idea what else to call it)!!! She came so close, I could have easily stroked her feathers but of course I didn't. I wasn't scared or anything, I just figured she wouldn't like that (imagine if even only a quarter of all tourists tried that, how annoyed she would have to be). So I sat there, eyeing her, talking, listening to her sounds. Then I took the picture below (yes, she was definitely posing when she wasn't cleaning her beak) and then she took off. Nothing - and I mean NOTHING - could compare to that during my vacation. I wasn't walking, I was floating for the rest of the day. Tonight, I finally finished this compelling, funny and insightful book that gave me historical information as much as some great insight into the Ravenmaster's military career and the mischief of these extraordinary birds. I am no longer surprised that they actually are working the crowds (two of them did after my encounter with Poppy, first performing for one side, then turning around and doing the routine on the other, it was glorious to watch). From the bottom of my heart: THANK YOU, Ravenmaster, for a book that isn't only entertaining (though it definitely is) but also moving and THANK YOU for spending some of your precious (free) time with this fan and being so generous to her. And THANK YOU, Poppy, for not doing to me what you did to that female student (she totally deserved it). ;) P.S. : This hardcover edition has nearly 300 pages, by the way, not only 208 as Goodreads claims. I was completely charmed by this book. Coming off of two decades of military service, Skaife applies and eventually gets a position as a Yeomen Warder at the historical Tower of London. He now has the additional title of Ravenmaster as he is responsible for the six ravens that reside at the Tower. It's a job that was voted strangest in England, but the way Skaife describes it shows it to be a strictly regimented yet hands-off position that allows the birds to be as wild as possible. But his care I was completely charmed by this book. Coming off of two decades of military service, Skaife applies and eventually gets a position as a Yeomen Warder at the historical Tower of London. He now has the additional title of Ravenmaster as he is responsible for the six ravens that reside at the Tower. It's a job that was voted strangest in England, but the way Skaife describes it shows it to be a strictly regimented yet hands-off position that allows the birds to be as wild as possible. But his careful husbandry keeps the birds safe from urban foxes, from the massive crowds of tourists who visit the tower each year, and also from each other. Skaife is a lover of stories and history which is what attracted him to his position in the first place. He not only cares for the ravens but gives tours to the public, detailing the long and often grizzly history of the Tower. In this book you get a front row seat to this history as well as Skaife's own background. Then, of course, there are the birds: fiercely intelligent creatures called by one scientist, "apes with wings" because of their huge brains. The author may not be an ornithologist, but he's well-read on the subject while having more one-on-one experience with the birds than any of us would have at our day jobs. His love for the birds and his job rings (or should I say squawks and clicks?) through this book. Let this storyteller talk to you about his birds for 250 pages. You certainly won't regret it. Ravenmaster by Christopher Skaife This is an audible book I requested and the review is voluntary. This is one of the best non-fiction books I have read this year. I enjoyed everything about this book! The book is laid out wonderfully simple and efficiently. This is a book about taking care of the 6-7 ravens at the tower of London! The author is the Ravenmaster. It is his job to keep the ravens safe and healthy and at the tower. This sounds simple but as he tells it, there is a lot to this job and Ravenmaster by Christopher Skaife This is an audible book I requested and the review is voluntary. This is one of the best non-fiction books I have read this year. I enjoyed everything about this book! The book is laid out wonderfully simple and efficiently. This is a book about taking care of the 6-7 ravens at the tower of London! The author is the Ravenmaster. It is his job to keep the ravens safe and healthy and at the tower. This sounds simple but as he tells it, there is a lot to this job and it is also fascinating! I would love to be an assistant! He tells the history of the tower, of the job, we meet each raven and their personalities, odd things the ravens have done, odd things people have done (including the assists and Ravenmaster), ghosts, life in the tower, and so much more! Each chapter is truly amazing! I was spellbound! I really think he has an awesome job because I love ravens! He also discusses famous visitors, death of some ravens, what they do then, and more. I imagine the physical book might have pictures but I googled it. The author's love for these birds, his job, his humor, intelligence, and pride in his country really shines through! I giggled a lot while listening to this! He also narrated the book which was wonderful to hear it from the Ravenmaster himself! I recommend this book to everyone!!! Grab yourself a cuppa, perhaps a couple of chocolate biscuits, and relax into the company of The Ravenmaster, Mr Christopher Skaife. I absolutely loved the conversational feel of this fascinating and very enjoyable biography of Skaife's careers past and present, and the genuine passion and enthusiasm he has for the headstrong, noble and beautiful ravens in his care. Skaife's storytelling, both serious and humorous is filled with information, anecdotes and moments of hilarity, all with the easy c Grab yourself a cuppa, perhaps a couple of chocolate biscuits, and relax into the company of The Ravenmaster, Mr Christopher Skaife. I absolutely loved the conversational feel of this fascinating and very enjoyable biography of Skaife's careers past and present, and the genuine passion and enthusiasm he has for the headstrong, noble and beautiful ravens in his care. Skaife's storytelling, both serious and humorous is filled with information, anecdotes and moments of hilarity, all with the easy charm that I suspect that The Ravenmaster employs in his daily life with the, at times, testing general public. With a real sense of wonder and fascination for the raven, and references to the most interesting works about them, the evolution of his employment, and his unique workplace, this is a highly enjoyable and entertaining read. Recommended. Narrated by the author, with whom I now want to hang out and have a drink. A wonderful story narrated by the author. Skaife convinces readers that ravens are indeed fascinating. Like the best of books that are memoirs centered on people and animals, the readers will come to respect and even love these creatures. Skaife is no nonsense, down-to-earth, but authoritative. Before his job at the Tower of London, he was in the British Army and credits that experience with developing his love of routine, order, and not least of all, love of his country. He served in Northern I A wonderful story narrated by the author. Skaife convinces readers that ravens are indeed fascinating. Like the best of books that are memoirs centered on people and animals, the readers will come to respect and even love these creatures. Skaife is no nonsense, down-to-earth, but authoritative. Before his job at the Tower of London, he was in the British Army and credits that experience with developing his love of routine, order, and not least of all, love of his country. He served in Northern Ireland and provides a brief view of what the very young often teenaged soldiers felt and experienced in that environment. I visited the Tower in 1993 in early morning, the best time to avoid the overwhelming crowds, and the ravens were the highlight (not the Crown Jewels). Even if you haven't been there, read this book! Ravens have lived at the Tower of London forever (or maybe since 1880). They have been under the protection of the royal family since Charles II (or maybe not). There is an age old legend that if the ravens ever leave the Tower, England will fall (or maybe drunk tour guides made that up during Victorian times). The Ravenmaster cares for the Ravens. He is one of the elite military men who guard the Tower of London. It's as if Alfred Pennyworth decided not to be a butler in Gotham in favor of cari Ravens have lived at the Tower of London forever (or maybe since 1880). They have been under the protection of the royal family since Charles II (or maybe not). There is an age old legend that if the ravens ever leave the Tower, England will fall (or maybe drunk tour guides made that up during Victorian times). The Ravenmaster cares for the Ravens. He is one of the elite military men who guard the Tower of London. It's as if Alfred Pennyworth decided not to be a butler in Gotham in favor of caring for corvids and mythology. The Ravenmaster loves the ravens and loves his part of telling the myth about the heart of England. Great bus book and goes very well with cold medicine. Before reading this book I had no idea there was such a job as Ravenmaster. I has been decades since I’ve been to the Tower of London and I have to admit that I didn’t notice the ravens when I was there. I was too busy being a small town boy down from Edinburgh where I was working on my doctorate, and seeing London really for the first time. I’m fascinated by ancient buildings and history, but, at the time, ravens were off my radar. Christopher Skaife, however, is a good story teller. With irony Before reading this book I had no idea there was such a job as Ravenmaster. I has been decades since I’ve been to the Tower of London and I have to admit that I didn’t notice the ravens when I was there. I was too busy being a small town boy down from Edinburgh where I was working on my doctorate, and seeing London really for the first time. I’m fascinated by ancient buildings and history, but, at the time, ravens were off my radar. Christopher Skaife, however, is a good story teller. With irony and wit he describes how he became Ravenmaster and the lives and minds of these complex birds. Since my visit to the Tower I have grown increasingly interested in animal intelligence. Corvids—birds of the raven, crow, and magpie family—are incredibly smart birds. Their problem-solving ability goes to and beyond abstract thought. As you read Skaife describing the things they do in the Tower you’ll be compelled to agree. That’s part of the appeal of the book; here is a gruff, rough army man waxing sentimental about birds. Like most military men he waxes rhapsodic about his overly regulated days in the army, but then the ravens force him to rethink a lot of what human intelligence unthinkingly proclaims. A quick read, this book isn’t all happy. Ravens die. People did cruel and nasty things to each other in the Tower of London. Armies exist to kill. Still, the ravens of history and literature strut through this book. They talk—or better, imitate human talk—and communicate. They can be cruel to each other and to their prey. We can’t help but be fascinated by them because they’re so much like us. An unexpected delight, this book has a lot to share. For me, as I mention on my blog (Sects and Violence in the Ancient World), it was a great way to start my 2019 reading. This was really just an okay read for me. The parts that were actually about the ravens were great - the stuff on his life in the army, not so much. I am known for my obsession with England and English history. The obsession that comes into a close second place: birds. Both subjects own a huge real estate in my heart and together, they result in my fascination with the ravens living at the Tower of London. Christopher Skaife is a name that has been on my radar, as he holds the title of Ravenmaster (and I am quite jealous of his job). Skaife highlights his role as the Ravenmaster and a Yeomen Warder in, “The Ravenmaster: My Life with the Rave I am known for my obsession with England and English history. The obsession that comes into a close second place: birds. Both subjects own a huge real estate in my heart and together, they result in my fascination with the ravens living at the Tower of London. Christopher Skaife is a name that has been on my radar, as he holds the title of Ravenmaster (and I am quite jealous of his job). 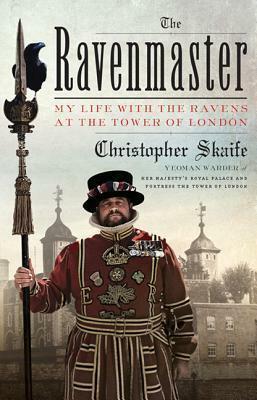 Skaife highlights his role as the Ravenmaster and a Yeomen Warder in, “The Ravenmaster: My Life with the Ravens at the Tower of London”. “The Ravenmaster” is in not claiming to be an animal behavioral study – Skaife is not a scientist- and is instead a light-weight portrait/memoir look at Skaife’s occupation as the Ravenmaster at the Tower of London. Skaife infuses the pages with a breakdown of the history of the position, the Tower ravens, and juicy tidbits concerning his daily life. This is also plumped with specific stories of his interactions with the ravens. Skaife’s approach is accessible and easy-to-read offering an enjoyable text for a wide, general audience. The language has a comedic streak but also maintains a professional tone. The issue arises with organization and presentation which take on a clunky descriptor. Skaife has the habit of running off on tangents and not completing thoughts or subjects thoroughly. Plus, Skaife’s recollection of his life stories and background don’t make sense with his life at the Tower (he strains to connect them) and are a stark contrast. Elaborating on this, the occasional animal biology/raven discussions aren’t in-line with Skaife’s writing style and suggests the possibility of a ghost writer penning these sections. Bluntly, “The Ravenmaster” is enjoyable, certainly, but it is slightly elementary level and lacking a cohesive thread. Despite the weakness, “The Ravenmaster” is appealing with its unique subject matter and encourages page-turning. Skaife excels at personalizing a high-profile position and allowing readers to share a first-hand experience into this one-of-a-kind job. With the progression of “The Ravenmaster” comes a smoother storytelling from Skaife, as he finds his ‘groove’. The content is more logical and focused on the ravens, adding clarity to the pages, At this point, the missing element is the absence of emotional connection as Skaife simply recalls or recounts stories but doesn’t truly express his feelings or thoughts regarding the incidents. The final chapters of “The Ravenmaster” entertain with personal stories and some historical references to the Tower.This leads to a conclusion the summarizes Skaife’s feelings on the ravens and the future of the birds. However, Skaife sort of drags out the finality with three short chapters when it could have been combined into one. Skaife supplements “The Ravenmaster” with a section of photo color plates, a list of the warders having held the Ravenmaster title, and a bibliography of sources available on both ravens and the history of the Tower. “The Ravenmaster” is a ‘cute’ memoir on an individualistic topic. Sadly, the execution is flawed, the text is somewhat flat Lacking emotional storytelling, and the pace lacks consistency. The best term used to describe “The Ravenmaster” is: thin. Despite these negative traits, “The Ravenmaster” is suggested as a quick read for those interested in ravens, the Tower of London, and/or unique jobs. What an interesting job the author has and I really enjoyed reading about it. I have been a fan of ravens and crows my entire life. When I met the ravens at the Tower I fell in love. Ordering this book was a no-brainer! WAITING FOR IT TO GET ACROSS THE POND was a bummer. All the UK reviews on social media just reminded me how far away I am. Once it was in my hands I devoured it. Great read. Charming, thoughtful and absolutely enjoyable. Those of you on Facebook and Twitter who follow Chris Skaife aka the Ravenmaster, know just what a highly intelligent and quirky individual he is. This book showcases both attributes, along with his obvious love for the ravens he is now priviledged to look after. What comes across is just how strong the personalities are of the various ravens. The famous Merlina being the most obvious. Chris writes with wit and warmth which makes for a charming combination. He is also capable of much pathos, as I Those of you on Facebook and Twitter who follow Chris Skaife aka the Ravenmaster, know just what a highly intelligent and quirky individual he is. This book showcases both attributes, along with his obvious love for the ravens he is now priviledged to look after. What comes across is just how strong the personalities are of the various ravens. The famous Merlina being the most obvious. Chris writes with wit and warmth which makes for a charming combination. He is also capable of much pathos, as I sat trying to read about Thor's death through the tears in my eyes. Highly recommended. Especially if you love a good memoir or a good natural history book. This combines both for a truly delightful reading experience. I enjoyed reading this book quite a bit. It is a combination autobiography and history describing the life of the Yeoman Warder who is in charge of caring for the ravens that live at the Tower of London. He tells anecdotes about working with the birds, explains why they live at the Tower, the procedures that are used for caring for these animals and provides a lot of information about the raven itself. As an American born and raised in Southern California, I have never had the opportunity to tour I enjoyed reading this book quite a bit. It is a combination autobiography and history describing the life of the Yeoman Warder who is in charge of caring for the ravens that live at the Tower of London. He tells anecdotes about working with the birds, explains why they live at the Tower, the procedures that are used for caring for these animals and provides a lot of information about the raven itself. As an American born and raised in Southern California, I have never had the opportunity to tour the Tower of London, but have visited Disneyland numerous times. I have often thought that being a tour guide for the Jungle Ride at Disneyland must be one of the best jobs at the park, as the tour guides consistently make silly jokes and bad puns and seem to be enjoying themselves immensely. Based upon Skaife's book, I am guessing that being a Yeoman Warder at the Tower of London is a very similar position. His descriptions of many of his and his coworkers' interactions with the public reminded me of the type of humor I have heard on the Jungle Ride. This good-natured humor permeates the entire book, and made it an overall pleasant reading experience. One of the unexpected pleasures that arose out of reading this book was his description of the ravens themselves, which are much more intelligent than I ever knew. I was reading this book on my iPad, and frequently found myself clicking away from the book to listen to recordings of raven vocalizations, and videos of ravens flying, or using tools or solving complex problems. It was a fascinating introduction to a subject that I knew nothing about previously, and I am looking forward to doing more research about ravens and their behavior. All in all, this was a quick and enjoyable read that I definitely recommend. I received an advanced reading copy from Farrar, Straus and Giroux via NetGalley. Thanks! There are many unusual jobs in the world, and equally many unusual jobs that literally millions of people have been the benificiary of unwittingly. One is to be the keeper, guard, frequently friend, and at times, adversary of seven ravens. These are the ravens that are found in the Tower of London. No doubt if you have been a tourist to the Tower you would have seen them. If not, rest assured the ravens saw you. What a wonderful read this book is. At once both informative in content and informal There are many unusual jobs in the world, and equally many unusual jobs that literally millions of people have been the benificiary of unwittingly. One is to be the keeper, guard, frequently friend, and at times, adversary of seven ravens. These are the ravens that are found in the Tower of London. No doubt if you have been a tourist to the Tower you would have seen them. If not, rest assured the ravens saw you. What a wonderful read this book is. At once both informative in content and informal in voice, Christopher Skaife gives the reader a vast amount of information about The Tower, the ravens and those who tend to them. Should the ravens leave the Tower, the legend says, the Tower will crumble and England will fall. With the attention and love Skaife has for these birds, England is secure. Each chapter gives much interesting information on the birds and their lives. The writing style is informative and personal. The chapters are not lengthy, but a reader is never left without some new insightful commentary. For me, one of the joys of the book occurred when the author discussed the ravens that formed part of Charles Dickens menagerie of pets and how and where ravens are a part of a novel. Dickens, it turns out, was very knowledgeable about ravens, their habits, and their unique personality. Indeed, he had a series of ravens as pets in his life. Another reason to like Dickens. I would have enjoy reading more about a raven’s physical structure and life cycle. While there were pictures and illustrations in the book I think there should have been more. These comments are quibbles. This is a delightful book and I urge you to read it. A charming book in a disarming voice, by the man in charge of the Tower ravens. I was as fascinated by his personal story: a somewhat delinquent adolescence, service in the British army for 22 years, a degree in anthropology as he began wondering what to do next, and then a job as a Yeoman Warder. His special task is seeing that the Tower ravens are well fed, well cared for and tucked away at night to protect them from the foxes. He tells stories about the three daily tours he leads, the ghosts A charming book in a disarming voice, by the man in charge of the Tower ravens. I was as fascinated by his personal story: a somewhat delinquent adolescence, service in the British army for 22 years, a degree in anthropology as he began wondering what to do next, and then a job as a Yeoman Warder. His special task is seeing that the Tower ravens are well fed, well cared for and tucked away at night to protect them from the foxes. He tells stories about the three daily tours he leads, the ghosts he might have seen, the ravens and their personalities, their feuds with each other, their rituals. He researches the belief that the ravens are so intimately tied to the Tower (which was first built by William the Conqueror in 1070) that if they leave the kingdom will fall, and he is able to establish that although ravens were mentioned at the Tower in earlier times, the legend didn't get into print until the 1880's. He also reviews the latest research on the intelligence of ravens and compares it to his experiences. It's clear he has enormous respect for the ravens he tends, and has considered what is best for them (making sure they are safe while providing them with a life as close as possible to the life they would live in the wild). The only thing missing: stories about the foxes! What I learned as a writer: That the personal life of the narrator is as important to the reader as the overt content of a nonfiction book. I wanted to learn about ravens and I didn't know I wanted to learn about the life of Christopher Skaife but it turns out I did find that equally as fascinating. This book is a fascinating mix of memoir, history, and day-in-the-life of a Yeoman Warder in the Tower of London. The short chapters were well suited for my chapter-a-day nonfiction reading habit. In fact, they’re so short, I often read 2-3 a day. It’s not terribly in-depth, and I don’t think it’s meant to be. He’s really just letting the reader look through a window into life at the Tower (the warders and their families live there), its history, and specifically, what it’s like to care for the This book is a fascinating mix of memoir, history, and day-in-the-life of a Yeoman Warder in the Tower of London. The short chapters were well suited for my chapter-a-day nonfiction reading habit. In fact, they’re so short, I often read 2-3 a day. It’s not terribly in-depth, and I don’t think it’s meant to be. He’s really just letting the reader look through a window into life at the Tower (the warders and their families live there), its history, and specifically, what it’s like to care for the ravens. I can’t like that they clip their feathers to keep them close. I was glad to learn there’s a way to do it so they can still fly, but the fact that flight, and therefore the ravens’ freedom, is still limited, doesn’t sit right with me. The care of the Tower ravens has improved over the years, and it’s clear that Skaife has a strong affection for the birds and wants to continue to make improvements to the tradition of keeping ravens at the Tower. I had some mixed feelings while reading this, but I really liked how the author balanced telling his own story and that of the ravens and the Tower. Anyone who, like me, enjoys books about "stuff," fascinating, trivia-filled explorations of almost anything, won't want to pass this up. Despite having lived in London, I honestly had no knowledge of the Ravens at the Tower of London and of the legend that warns that if the ravens disappear, the tower will fall and "great harm" will befall the kingdom. Through Skaife's vast knowledge, obvious affection for his avian charges, and enthusiasm for his subject, all our questions are answered--and we Anyone who, like me, enjoys books about "stuff," fascinating, trivia-filled explorations of almost anything, won't want to pass this up. Despite having lived in London, I honestly had no knowledge of the Ravens at the Tower of London and of the legend that warns that if the ravens disappear, the tower will fall and "great harm" will befall the kingdom. Through Skaife's vast knowledge, obvious affection for his avian charges, and enthusiasm for his subject, all our questions are answered--and we learn more than we ever expected. He's a natural storyteller, and, in addition to his responsibilities caring for the ravens, he conducts tours of the Tower complex. All that information is related here--ornithology, history, the individual ravens and their personalities, the history of the tower with its murderous past and the possibility of ghosts--in the jaunty style of a natural storyteller. Short, anecdotal chapters speed the pace, and Skaife's enthusiasm for all his discusses is infectious. Two incentives for listening to the audio: Skaife reads it so listeners experience his animated performance and an interview with the author concludes the audio. Totally diverting. Such an enjoyable book to read! This will be the perfect gift for someone who enjoys reading, but it's hard to figure out what they like. It's light, fun, and easy, with some history, some fascinating information about the ravens, and and a few lovely pictures. Honestly, that's the only reason I didn't give it 5 stars - I truly wish there were more pictures. I've seen some of the gorgeous ones on Twitter, and was hoping for more. However, his Twitter account is pretty neat, so it's well worth ch Such an enjoyable book to read! This will be the perfect gift for someone who enjoys reading, but it's hard to figure out what they like. It's light, fun, and easy, with some history, some fascinating information about the ravens, and and a few lovely pictures. Honestly, that's the only reason I didn't give it 5 stars - I truly wish there were more pictures. I've seen some of the gorgeous ones on Twitter, and was hoping for more. However, his Twitter account is pretty neat, so it's well worth checking out in tandem with the book! Stepping back into history is fun, but ravenmasters do not really seem to go that far back, according to Skaife's comment that he is but the sixth appointed ravenmaster at the Tower of London. I recommend this very well written book for lovers of London history because tourists who step into the Tower estate will find themselves so crowded by other tourists that they may not get as many stories as they wish--and certainly not from the ravenmaster. I liked reading about the ravens and Skaife's fr Stepping back into history is fun, but ravenmasters do not really seem to go that far back, according to Skaife's comment that he is but the sixth appointed ravenmaster at the Tower of London. I recommend this very well written book for lovers of London history because tourists who step into the Tower estate will find themselves so crowded by other tourists that they may not get as many stories as they wish--and certainly not from the ravenmaster. I liked reading about the ravens and Skaife's frank admiration of them. We are beholden to bird lovers and rescuers everywhere. I was enchanted by this book! #The Ravenmaster and its cover art. #NetGalley. I really enjoyed this look behind the scenes at life in the Tower of London. I have followed Christopher Skaife on social media for a while, and enjoyed seeing the ravens when I visited last year. This book details his life and military career, what it's like living in the castle, and the ins and outs of caring for the ravens 365 days a year. I listened to the audiobook narrated by Mr. Skaife, and I think hearing the story in the author's own voice enhanced my enjoyment. This book feels like I pulled up a chair at the local pub and enjoyed a pint with Mr. Skaife. I liked learning about the 6 or so ravens that live at the Tower and the job of the Ravenmaster to care for them. Ravens are intelligent birds, one likes to play dead for attention and they are amused by the game of Kerplunk. Their diet is mainly carnivorous, pigeons, rabbits and dog biscuits soaked in blood. The author's observations of life for those who actually live on the castle grounds (@150 peopl This book feels like I pulled up a chair at the local pub and enjoyed a pint with Mr. Skaife. I liked learning about the 6 or so ravens that live at the Tower and the job of the Ravenmaster to care for them. Ravens are intelligent birds, one likes to play dead for attention and they are amused by the game of Kerplunk. Their diet is mainly carnivorous, pigeons, rabbits and dog biscuits soaked in blood. The author's observations of life for those who actually live on the castle grounds (@150 people) is also interesting. Quick, entertaining read. A thoroughly enjoyable read. Autobiography, ornithology, and history told in a casual, storytelling style that flowed easily and kept me engaged. I laughed at the ravens and the Ravenmaster, and learned some things about the Tower of London.